Bathroom vanities come in many shapes, sizes and styles. One only has to take a trip to a local home improvement store to see what is popular. But what if you’ve gone to the store and you don’t see anything that you like? What then? Well. . . you could consider having something custom-made for you, search the internet or you could see what is available locally special order. Recently I asked myself that same question. And what I found out was rather surprising. 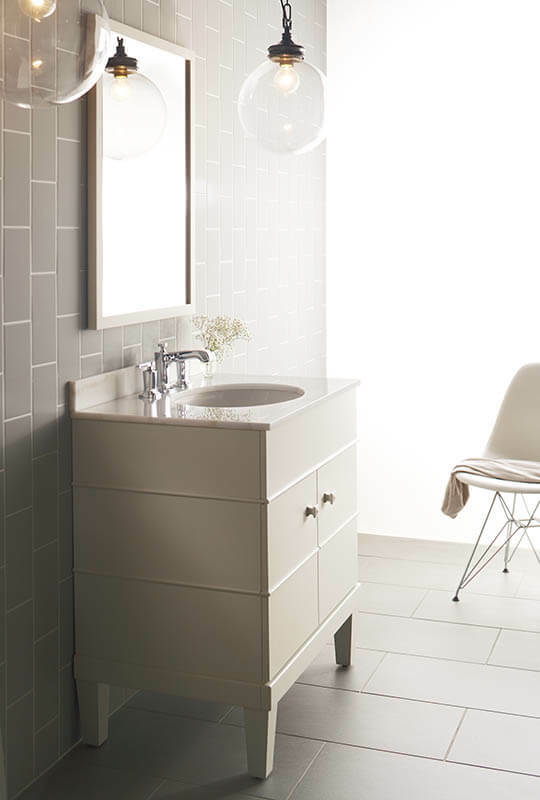 Did you know that Kohler makes bathroom vanity cabinets? I certainly didn’t. I knew Kohler makes the rest of the fixtures in the bathroom; from faucets and shower heads to toilets and tubs. But it never even occurred to me to check for bathroom vanity cabinets. Kohler has several vanities available and much to my pleasure, it appears this is a market they’re expanding on! One vanity I found in particular that caught my interest is the Kohler Evandale bathroom vanity. I love the simple furniture like design, especially since it has the legs like a piece of furniture without being ornate. Keeping simplicity in mind, while maintaining a classical flair the Evandale has no drawers but does offer two doors. The doors have matching finish square knobs and a little bit of architectural interest with 2 pieces of trim running vertically across the front and sides. It comes in two colors and is a three-piece set that includes: vanity cabinet, stone vanity top and under counter sink. On top of that, if you are so inclined they make a matching mirror you can purchase separately. The Evandale three-piece vanity is a great transitional design, which allows the piece to match a variety of bathroom styles. It comes in two colors, Lily (my favorite!) which has a white stone vanity top and Sapele, which has a black stone vanity top. The Sapele color is a beautiful rich wood, while the Lily is white. When looking at the colors, I immediately imagine the Lily in a more feminine bathroom with little glitzy touches. Nothing overly “glam” mind you, but just a little sparkle here and there! All the while the Sapele looks as though it could lend itself into more of a masculine or rustic design. See what I mean by the Evandale being a great transitional design? Going from feminine to masculine with just a change of color? That’s incredible! The price of the Evandale is around $1200 depending on which color you go with. So expect to pay more than what you would get off the shelf of a home improvement store. 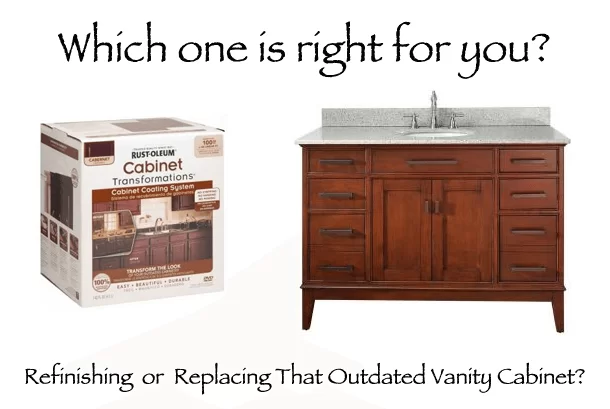 But considering you’ll actually have a quality built cabinet and stone vanity top, from a brand you can trust, I think it’s worth the extra money! And I will definitely be checking out the Evandale in Lily for my next bathroom remodel.